Google Translation was good with some minor fixes.. This is a man who achieved the unthinkable: he made Rafael Nadal do pushups, made him walk around in his underwear at the hotel lobby & play with fever. He has a perennial smile, privileged hands for tennis and a deep friendship with the winner of Roland Garros 2011. 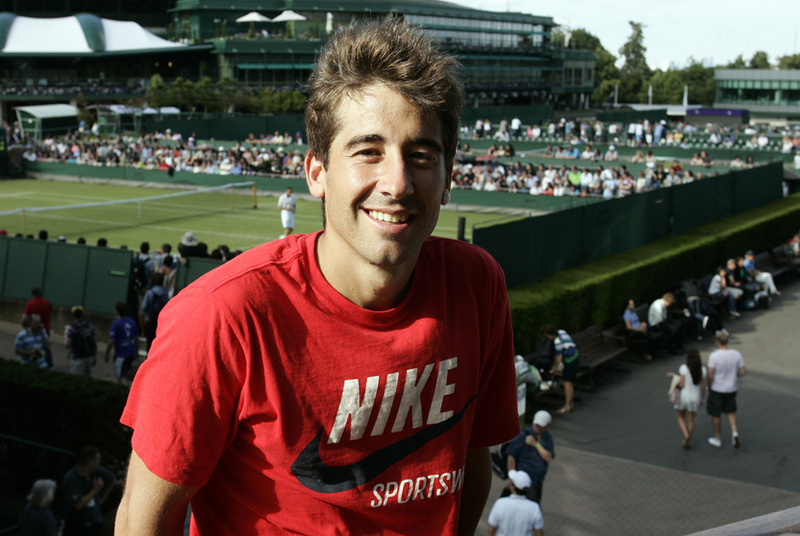 This is Marc Lopez, an elite's doubles player, travel companion and training partner of the winner of 10 majors, and often his partner on and off court while playing doubles or during a vacation in Bangkok, competing with a racket or a PlayStation control. Through him, we discover a different and freer Nadal, the joker nen (no idea what this word is sorry) he met years ago when they shared a room while they were competing in teams in Barcelona. "That was the beginning" "That room... none of us are the order personified. Rafa is a restless guy. He is always thinking about doing things. He is not the type of person that doesn't do anything for hours. In the room we spent little time, playing Playstation. With him we laugh a lot, because he's always joking. Since we are confident with each other we say silly things, things I do not think seriously, we tell each other jokes"
For example? "Sometimes I say, 'Look at Roger Federer, how well he plays, he really is the true number one." And he laughs out load. I laugh when he hits his forehand volley cause his arm's very straight. "And you're the best?" I say. In practice, we always play bets, we do some jumps raising our knees to the chest, and we do push ups, where the other one says, like in the middle of the dining room for example"
Lopez and Nadal are together on numerous trips throughout the year. They often share the room when the double's player is eliminated from the tournament. For them it is natural. Peculiar situations come out of those close bonds. One day in their hotel in central Paris, they appeared in their underwear and began to do push-ups. Another day, one of them had to do them in front of a lot of tourists in the lobby of the Crown hotel in Melbourne, Australia. Lopez, who admires how his friend has treated success, has his own theory to explain these events. "One thing is clear," he says. "All that Rafa does, all of it, he does it at 100%, the golf, the beach... he can not do anything without putting in his best effort, without giving the fullest." The tennis player Nadal disappears when he leaves a tournament and hangs out with friends. He's "one more" of the group. One that jokes. One, they say, "that makes you feel good when you're with him, but for many others he is a God." One that organizes holidays for all, and in a group. "Every summer, he rents a boat for a few days with 8 or 10 friends" Lopez says. "In 2009 we went to Cannes, and other years we were in Ibiza, Menorca ... but nothing, no parties. We go fishing, we play soccer on the beach." "He's very generous. He pays for everything. Then, when we go out to have dinner we do a pool to invite him, because it is the least we could do: all of the other things are for free. Last year we went a week to Thailand." In an equally exotic destination and earlier this year, just before the start of the Australian Open, Nadal contracted a virus. It was in Doha. He lost the semifinals of the singles tournament. "He was destroyed, with a high fever" Lopez recalled. Even so, he decided he would play the final of the doubles with his friend. "He said he was excited. I appreciated it very much. He left his skin out there and he was destroyed, very tired. I know it cause I was there. Things like that, they fill you up. We won."